What is a key component of Elon Musk’s wonderful Teslas? Copper. What enables you to catch Kohli’s and Dhoni’s thunderous sixes on TV? Copper. What helps keep your immune system healthy and produce red blood cells? Copper. What helps millions of youths swoon over Nayantara’s histrionics on the big screen? Copper. Copper is considered a ‘base’ metal, i.e., a common and inexpensive metal, as opposed to a ‘precious’ metal, such as gold or silver. But if we were really aware of just how big an impact copper has in our lives, I am willing to bet that anyone would chose copper over gold as the truly ‘precious’ metal. India currently has three major copper manufacturers: Hindalco, from the venerable Birla Group, Hindustan Copper, a mammoth PSU, and Sterlite Copper, part of the global Vedanta conglomerate. While the key product of these companies is copper, the manufacturing process also yields associated products such as Sulphuric acid, Phosphoric acid, and even precious metals. This three companies together contribute the raw materials vital to agriculture and numerous industries, including the automobile, consumer durables, electrical and construction sectors. The International Copper Association – India has shared that the demand for copper in India, currently at 970kt, is poised to reach 1,812 kt in less than a decade. However, only 50% of the copper requirement is met through supply from domestic refined copper producers while 30% is met through imports. However, since only three manufacturers exist, any fluctuation in their output will eventually have an impact on the downstream industries and lead to a dependence on expensive imports. 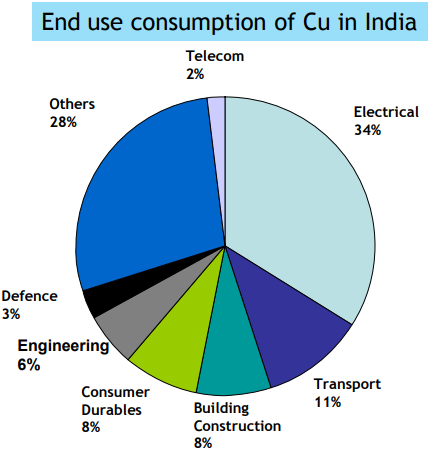 For example, Sterlite Copper alone enjoys a 36% market share in India. Thus, it isn’t hard to imagine the impact a sudden cessation of a company’s production would have on the prices of consumer durables, and other vital industries such as the fertilizer industry. Fertilizer prices will go up, pushing up the price of production for farmers and stretching their meagre resources. A semi-agrarian economy like India would see a significant negative fallout from a drop in production. In such a scenario, one must ponder whether rejecting and calling for the closure of a major copper-producing unit is the wisest step forward. The past few weeks have seen a steady stream of protests online and offline against the operations of Sterlite Copper in Thoothukudi. Of the hundreds of companies that call Thoothukudi their home, somehow Sterlite Copper has become painted as the company solely responsible for generating pollution. In keeping with the rising trend of social media ‘activism’, a number of page owners and influencers have published posts amplifying poorly researched content about copper production. Characterized by emotional rhetoric and almost no logic, the irresponsible sharing of such content has succeeded in whipping up an unprecedented level of myopic mass hysteria. For example, it is rather ironic when social media ‘activists’ post content attacking Sterlite Copper with the hashtag #SaveFarmers, little realizing that their actions could drive up fertilizer prices and contribute towards making the hardworking Indian farmer further burdened with debt. These effects will be felt not just in Tamil Nadu, but across India. There is also a lot of active tweeting by groups purportedly representing the interests of the global Tamil population online. Their posts are often addressed to the Tamil diaspora, which has established a wide presence in the Gulf, the USA and the UK over time and become prosperous through hard work and dedication. Now, a diaspora is a term that refers to communities who have dispersed to other locations, often in search of a better education, better jobs, and ultimately a better life. Employment is the first step in a person’s socio-economic development. So it is curious to see these same groups now protesting against Sterlite Copper’s plant expansion project, which as per the company’s estimates can provide more than 27000 jobs to Thoothukudi’s youths. Another aspect to consider is the employment scenario in Tuticorin. A large part of it is driven by the presence of thermal (coal-fired) power plants generating more than 4600MW of power. However, this is at a time when the world is steadily abandoning this form of generating electricity. Coal is considered to be among the dirtiest of fossil fuels, producing the least amount of energy and the greatest amount of pollution per kilogram consumed. Countries are increasingly embracing renewable sources of energy to reduce emission levels. 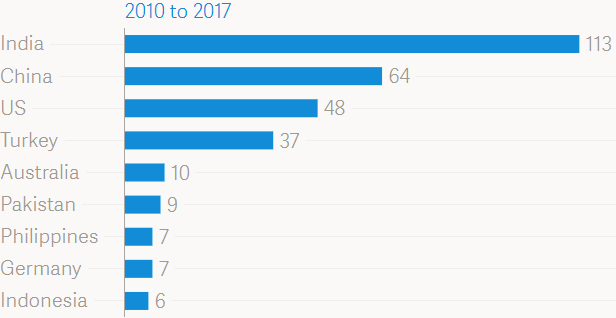 A report by Greenpeace and CoalSwarm (Coal Phase-out, October 2017) found that India had the maximum number of firms exiting the coal power business entirely, with 113 companies shutting shop between 2010 to 2017. This is thus a trend that is already in motion in India. A recent article by Bloomberg (Coal Power Pace Slows in India as Glut Leaves Plants Unused, January 2, 2018) mentions that nearly 40% of the India’s thermal power production is unutilized. This corresponds with the Indian government’s current vision of driving the adoption of renewable energy production. An article by Down To Earth magazine (The End of Coal, October 2017) predicts that the majority of coal-fired plants may close by 2050. This places a big question mark over the employment of the thousands of people currently employed at the thermal power plants across Tuticorin. The city may be staring at the possibility of massive job losses and unemployment in the near future. In view of the situation described above, embracing new industrial projects is a sure-fire way of ensuring that Thoothukudi, the Pearl City of Tamil Nadu, remains a jewel in India’s industrial landscape.